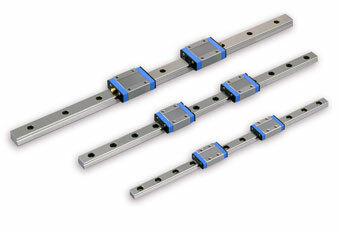 Linear Motion Guide / LG Series | Products | Kuroda Precision Industries Ltd.
Ultra-small linear motion guides with a simple 2 ballways of 4-point contact structure created by leveraging KURODA’s proprietary small sizing technology. The 2 ballways of 4-point contact structure also used in ball screws, and created based on the design and manufacturing know-how accumulated over the years, delivers high-precision, smooth operation. This structure can support load from any direction in a balanced way, making it able to deliver high accuracy and rigidity in a stable way even in applications where the direction and size of the load vary, or where the acting load is a complex load. The lubricant impregnated in the lubrication tube inside the ball circulation system continuously provides an appropriate amount of oil to the surface of the circulating balls. Since the lubricant maintains lubricating performance over long periods of time, it does not require maintenance. The lubricating performance can be maintained over long travel time because the amount of lubricant consumed is low as only an amount of oil necessary to maintain the lubricating performance of the ball guide is provided from the lubrication tube. The block is equipped with a built-in retainer which prevents the steel balls from falling out when the block is removed from the guide rail, allowing for easy mounting to machines and equipment.